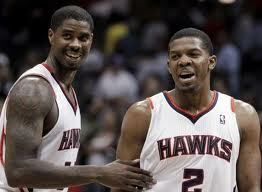 Marvin Williams is gone and Joe Johnson is on his way out once Deron Williams re-signs with the Brooklyn Nets. Atlanta Hawks’ general manager Danny Ferry has moved two of the team’s biggest contracts in only one week on the job. Williams who was displeased with how he was being used on the team, requested a trade earlier this season. He was traded to the Utah Jazz for Devin Harris. Johnson has been traded to the Brooklyn Nets for a bunch of expiring contracts and the Houston Rockets’ 2013 first-round pick. The Hawks owed Johnson $90 million over the next four seasons so getting rid of his contract clears a lot of cap space for Atlanta going forward. Now the only thing left for Ferry to do is deal with the Hawks’ star forward Josh Smith. Smith also requested to be traded earlier this year and he is in the last year of his contract. It will be interesting to see if Ferry trades him or can convince him to stay. If Smith stays, he and Al Horford will be the main building blocks that Ferry uses to rebuild the Hawks into a winner. If not then Smith should bring back plenty in a trade. Roosevelt Hall is an NFL Blogger for The Sport Mentalist and an NBA Blogger for The Sport Mentalist 2. He is also a Sports Reporter for Pro Sports Lives. He can be contacted at sportmentalist@yahoo.com and be sure to follow him on Twitter @sportmentalist. Do you have a favorite team or player you want to know more about? Email your questions to sportmentalist@yahoo.com and I’ll devote a post to it. Send your name (or an alias) with the question and get a shoutout on the site. Want to offer a rebuttal of one of my posts or simply feel you can do better? Then email your article along with your name (or an alias) and I will post it.